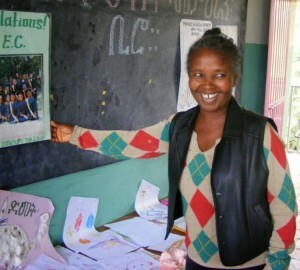 Since 2010, Azalech Tadesse has worked as an early childhood care and education (ECCE) facilitator at the Gelan II public primary school and ECCE centre in Ethiopia. Her approach to helping the youngest children living in this impoverished Addis Ababa neighbourhood to learn, grow and thrive despite the obstacles they face has recently been recognized by the Regional Education Bureau by an award of excellence in teaching. In May 2014, Azalech and the centre went up against 350 other public and private ECCE centres to win the prestigious award, which was accompanied by a cash prize of 3,000 Birr (approximately $175) for Azalech – more than one month of her salary. Azalech is clearly passionate and skilled at her job. “The training I received through EDA has helped me become a better teacher and able to train other ECCE facilitators at my school. I now have a much better understanding of the four quadrants of childhood development – physical, mental, social and spiritual – and I am incorporating them into my teaching,” she told Heather Johnston, CFTC’s Director of Programs, and Gebriel Galatis, CFTC’s Country Representative in Ethiopia, during a recent visit. EDA has supported Azalech and other teachers with funds from CFTC and its supporters to train teacher and purchase classroom materials, which make a big difference in the quality of teaching and education children receive. When asked to estimate the value EDA has added to her ability to teach well and to children’s ability to learn, Azalech was at a loss for words. “She started to list all that EDA had contributed to her ECCE centre since 2010: audio-visual materials, print materials, play material, funds to produce learning materials, outdoor games equipment, teacher training and so much more,” said Heather. Azalech is a strong advocate on the front-lines for this work. “EDA’s intervention impacts not just the children but the whole community, particularly the work it does to help people understand the value of education so that they send their children to school,” said Azalech. Part of Azalech’s challenge is to convince parents of the value of education, particularly ECCE. Azalech says in the neighbourhood where she teaches on the outskirts of Addis Ababa, people don’t value education and don’t support their children to go school. She spends a lot of time working with parents to help them see the value of education, and doesn’t hesitate to use her own situation as an example. “Early childhood education is the foundation for all learning and has a critical impact on the future learning potential and success of students. My own daughter is going into grade 10. She’s a top student, and I’m convinced that this is because she got a good start at an ECCE centre,” said Azalech.